We must be doing things right because we've been servicing Melbourne's Eastern suburbs with new benchtops for over 10 years. We're really proud to say we have an established reputation for providing exceptional service, exceptional value and exceptional benchtops! We supply Laminate, Engineered Stone Bencthops and Granite Benchtops and we have an enormous array of options with something to suit all styles, colours and budgets. Our team will remove your old kitchen benchtop, unplug your appliances, fit your new benchtops, refit your appliances, clean up and take the old benchtop with us - leaving you to enjoy your beautiful new kitchen benchtops! Need to update your bathroom or laundry? We can help with that too! 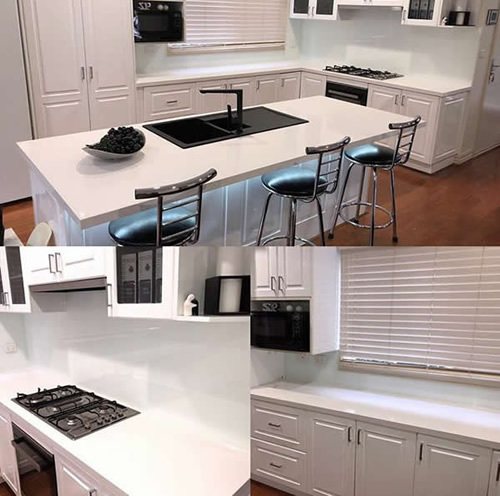 Whatever room in your house you are looking to update, the friendly team at Just Benchtops can help by offering expert advice on new benchtop options. Contact us to book an appointment to discuss your home updates today.